An improved version of the old standby! Great for getting ashes out of hard-to-reach corners and cleaning the smoke passages of wood cook stoves. 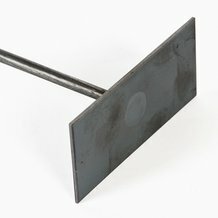 29"L, blade 4" x 1-7/8"
This is just an unfinished steel rod welded to a piece of sheet metal. It does not look very high quality, can easily rust or be bent. Does not look durable. It also does not fit under my grate so I will have to grind it down a bit to be useful to me. 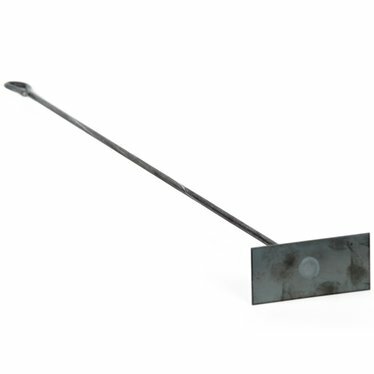 The soot scraper is made of great quality and is made heavy duty. I like it and works great. I would recommend the scraper to anyone. Great stove tool! Works great in the corners to remove ash that the broom dosen't get. Handy for moving the coals into a pile. Glsd I have it hanging by my woodstove.